We are going to start with the good stuff, because it’s a Friday. You have a few more days to sign up to win a gorgeous WOLF gourmet blender– you GOTTA do it because it is such a nice appliance and you will use it daily. Ok, now I have to let you in on the hard stuff, because sometimes that is real life. It is with a heavy heart that we learned today Pia has celiac disease. We have been gluten free as a family for 2 ½ years, but this is definitely an extra jolt of WHOAH. On top of the 36 food allergies Pia has, now we know that auto immune disease is part of the package. Coco and I have to be tested too- I will let you know what happens. And in celebration of being GF for life around here we made pizza. 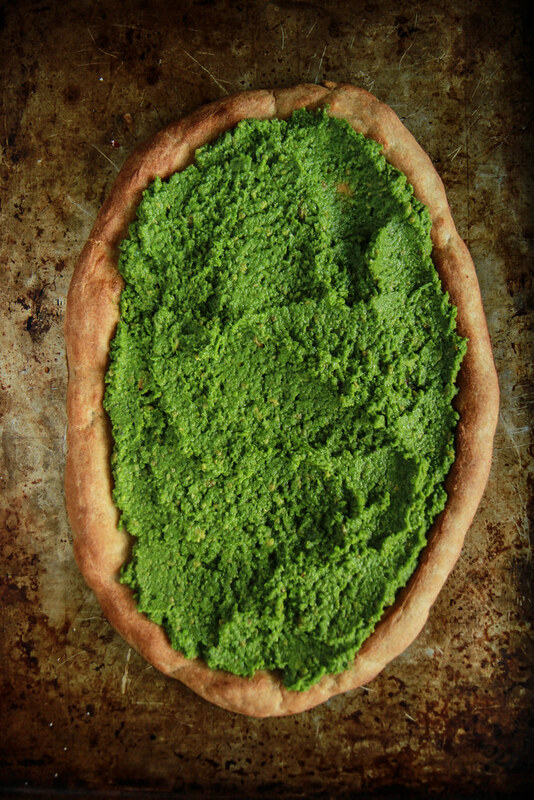 The kids had all the stuff they like on it, and the grownups get Green Goddess Pizza! Its got a thick slather of Broccoli Pistachio Pesto, a ripe avocado (everything is better with avocados) and a fresh bright green salad on top. It’s so delicious and reeeeally pretty. I have also served this as an appetizer when friends are over. 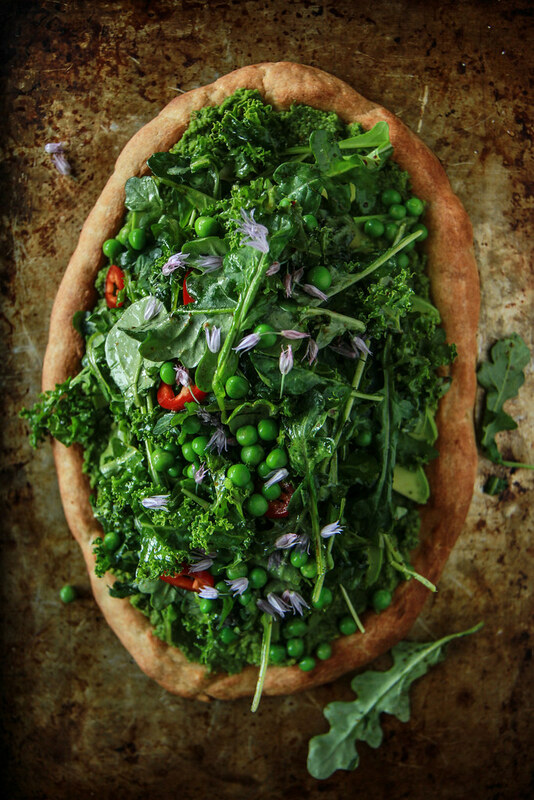 Find the Pizza Crust recipe here, or in my new book, which has an even better updated recipe for the best ever gluten free pizza crust! Preheat the oven to 400 degrees. Bake the crust. generously drizzled with olive oil at 400 for 15 minutes. In a medium pan over medium-high heat add the 1 tablespoon of olive oil and the broccoli and sauté until tender about 4-5 minutes. In the bowl of a food processor add the broccoli, garlic, pistachio, vinegar and olive oil. Pulse until you have a thick and somewhat smooth pesto sauce. Season to taste with kosher salt. 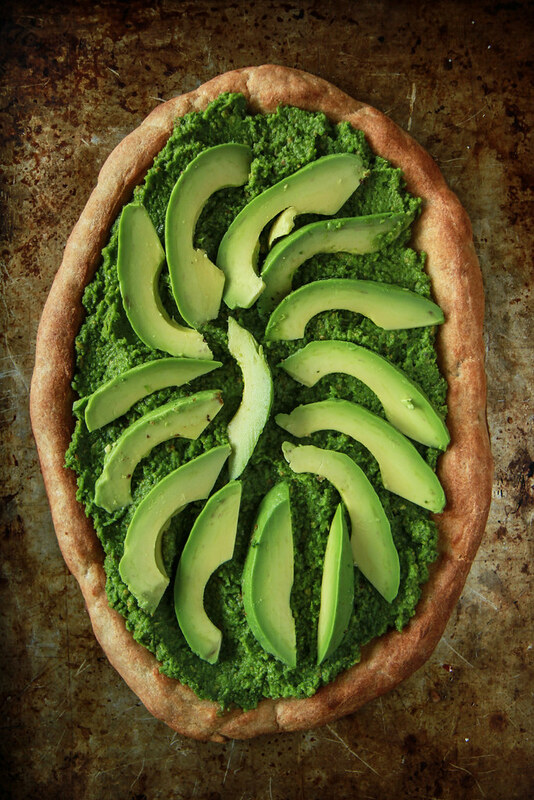 Spread the pesto onto the par-baked pizza crust and add the avocados. In a mixing bowl toss the greens, peas and chili. In a small bowl whisk together the garlic, balsamic and olive oil. Pour the vinaigrette onto the greens and toss well. Add the salad to the top of the pizza, slice and serve. Drooling over here at 5:45am! Gorgeous!! What a nice vibrant and fresh pizza! I’m so sorry to hear about Pia but I absolutely love your attitude about it. This pizza looks insanely delicous! OMG!!! Wow, Heather! Let me at it….I’ve GOTTA try this!!! That was my response when I first saw the pic in my email notification. Then I read your post. I’m so sorry to hear about Pia’s diagnosis. But I have to say that she is one lucky little girl to have you as her mom, with your culinary skills and nutritional wisdom, and your positive attitude. I know you and Pete will find the sunny side of the street. And I know there’s a lot of support out there. I wish the best for your family. So sorry to hear about Pia’s diagnosis. You are wonder woman and I know she is in the best possible hands! 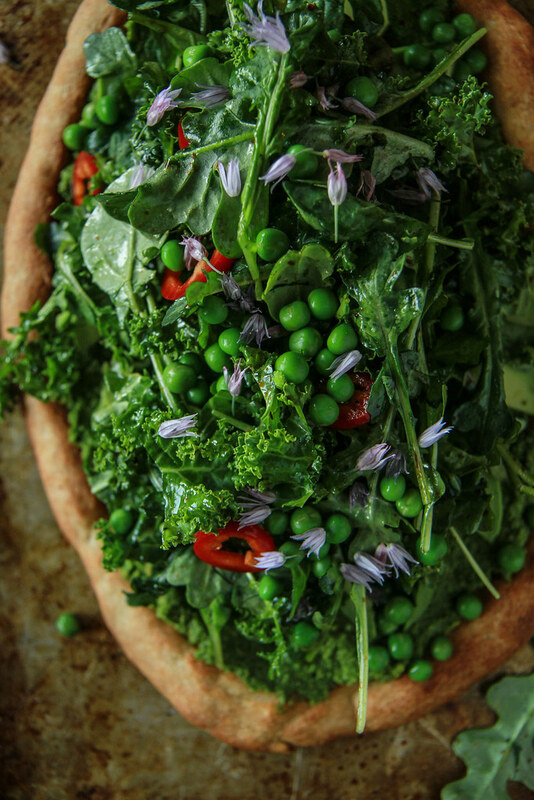 And this pizza is such a stunner, must make for the weekend! That looks AMAZING. You’d have to work out the carbs obviously, most would be from the broccoli, but at a quick glance at the ingredients, they’re mostly all low carb.